The options are numerous. Nevertheless, to make life easy, we selected the following standard BooQis for you: Z-BooQi, B-BooQi, V-BooQi and C-BooQi. Click the icons at the bottum of the page for more information. Size does matter! Select the size that matches your campaign: credit fits in your wallet, pocket in your pocket, a postal BooQi is ready to pop on the post and jumbo offers maximum space for your communication. Finally, you decide the insert size with the number of (vertical) panels. 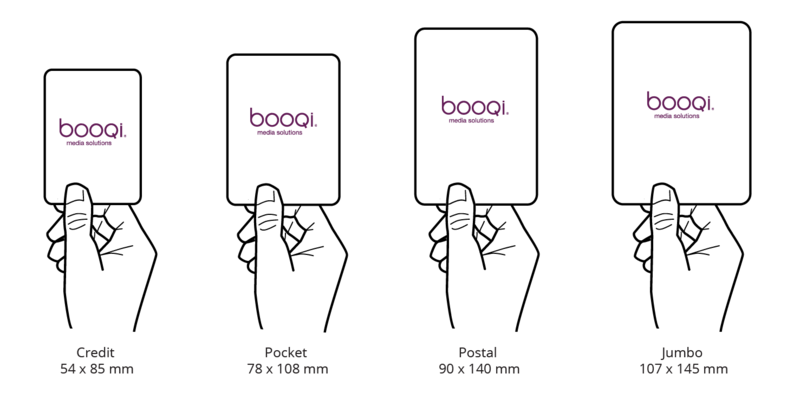 Standard BooQis go from 4 to 12 panels, other options are possible. From 100 to millions, we can offer a solution! Because every important message deserves a powerful carrier, we do not use a minimum number of BooQis for production! If you are interested in a small number of BooQis, let us know and we will give you more information. Need help in finding your specifications? Our team is happy to advise!